So many of my favorite things in this outfit. This fuzzy topshop sweater is seriously so soft and cozy. I could wear it everyday. My Tory Burch boots that I got during the friends and family sale. These are my favorite boots of all time. They are really comfortable, I love the color and I love how high they come. 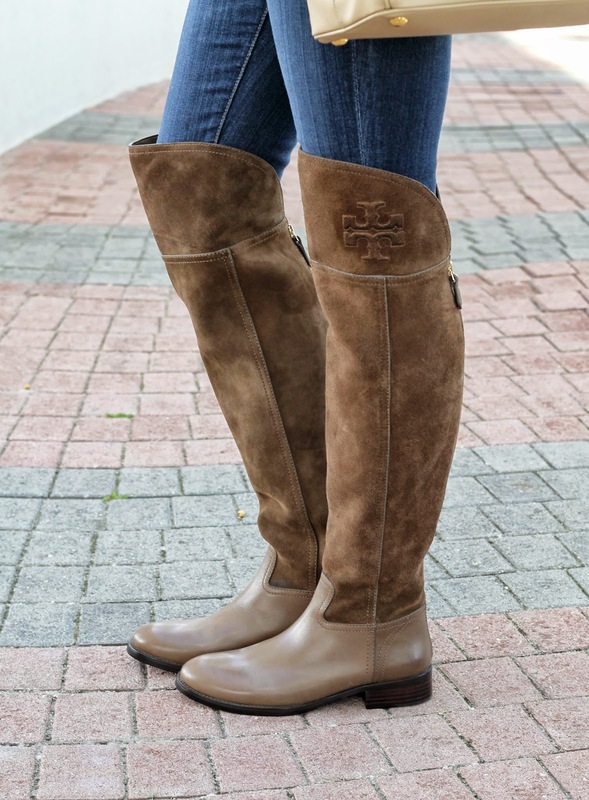 Literally the perfect boots that will go with everything. Yesterday I wore them with a dress! And last but not least this herringbone hat from Prima Donna. Ugh! I love it so much! I love herringbone in the Fall. And i love that it is smaller then some of the floppy hats that I have. Thank you all so much for reading. I hope you have a great weekend! Matt and I are gonna do lots of baby shopping this weekend! I think that is my favorite thing to do right now. I love these booties! Amazing casual look. That sweater looks so cozy and those boots are gorgeous! Have a great weekend! You always have the most amazing jewellery! Fantastic outfit! Those boots are beyond fantastic! The color is just what I want for Fall. I love that sweater and those ootk boots are gorgeous! Hope you have a wonderful weekend! cool outfit...i like your boots...and your hat is fab..
ohhhh! those boots are so cute! why is everything tory burch so perfect? Dying over the boots and hat! Perfect fall look! I have to make this look one of my favorite's for this season. Gorgeous and in love with those Tory boots! This outfit is such a great fall look. Love it!!! And the Prada bag is to die for...! Love the boots. Great casual fall look! Those are the most gorgeous OTKs I've seen around!!! I love your boots and hat!!!!!!!!!!! You are the cutest pregnant woman! I love the color combo of your sweater & boots. LOVE this outfit, and especially the necklace! love the subtle color block on the hat! Perfect way to stand out this fall! 😊 also, I only hope to be half as cute as you while pregnant!